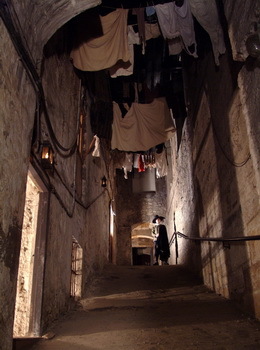 This year The Real Mary King’s Close marks its tenth anniversary as a top visitor experience with a programme of one off special events as unique as the attraction itself. Birthday celebrations will kick off with the attraction “Calling All King’s To The Close”, appealing to those named Mary King to join in the celebrations for a gathering of King’s at the attraction. Added to this, those who share their name with this remarkable Edinburgh woman will be given free entry during the month of April, marking the month the venue officially opened its doors for the first time back in 2003. During August, whilst the city heats up for the summer festivals, visitors can experience a chilling Edinburgh Festival Fringe first as The Real Mary King’s Close gets darker than ever before for this late night special tour. Not for the faint hearted, the ‘Dark Truth Tour’ will tell the sinister tales of plague and pestilence and murder most horrid witnessed by those who lived and worked in the closes. With lights turned low and shadows cast wide, those who dare to be there will learn the whole truth behind the myths and mysteries shrouding this hidden city, the question is, are they brave enough? An eerie late night Dark Truth Tour on Halloween for those that dare will mark the launch of ‘Close Fest’, a week long celebration of underground events. Visitors can expect to experience The Close as never before with events ranging from comedy, live music and fun for the kids, in what promises to be a celebration like no other previously witnessed in this hidden warren of closes. In the wintry month of December visitors will feel a further chill in the air at The Real Mary King’s Close when they learn the shocking truth that until fairly recently Christmas across the city was banned. The ‘Christmas On The Close’ tour reveals the history surrounding Christmas as an ordinary working day for Scots that saw the celebrations moved to Hogmanay instead. The story of those early merrymakers who paved the way to Edinburgh now playing host to one of the biggest New Year street parties in the world will culminate with a warming mulled wine and mince pie. Ten years on and The Real Mary King’s Close has grown to become an award winning five star attraction that ranks up there with the top things to see and do in Edinburgh. With daily tours combined with one off special events, this year there are even more reasons to visit this underground time capsule to share in the celebrations.